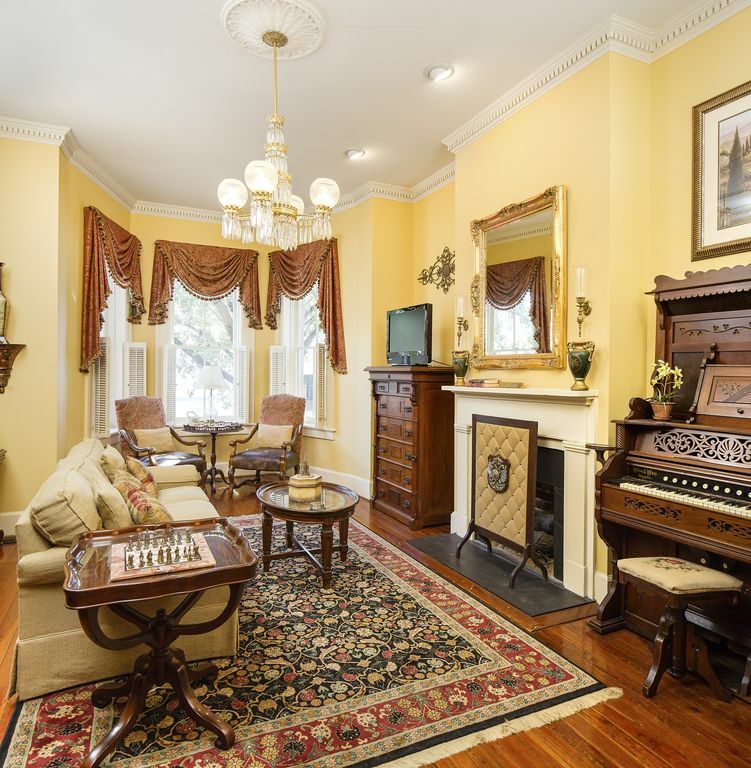 Exquisite, 1883 home with intimate appeal located in the Heart of Savannah's Historic District. Conveniently located near historic landmarks, restaurants, and shopping. Beautifully decorated home with period furnishings. Features include living room, dining room, courtyard, and spacious bedrooms. Private carriage house also available. The main house has 3 bedrooms, 2.5 baths, and sleeps 6 people. The carriage house has 1 bedroom, 1 bath and sleeps 4 utilizing a high grade leather sleeper sofa in the living room. Both units have a full kitchen, washer/dryer, jetted tub, fine furnishings, offstreet parking, and other amenities too numerous to list. My name is Robbie Bell. I work in real estate. I love to travel. After having the opportunity to travel to many different cities, I still believe that Savannah is one of the most beautiful cities in the world. The history, architecture, and local culture of Savannah are all unique. What better way to experience the architecture and history of Savannah than staying in a beautiful historic home? I really can't think of any. This picture was taken while visiting Chengdu, China in early 2009. While in Chengdu, I was fortunate enough to visit the Giant Panda Research Center and interact with a panda cub, under the supervision of a research scientist. I believe that Savannah is one of the most beautiful cities in the world. I had always dreamed of owning a historic home in this incredible city. In 2000, I purchased this home, which at the time was operating as an owner occupied Bed and Breakfast. For 2 years, I operated the property as a Bed and Breakfast. In 2002, my family and I were able to travel to Italy. While in Italy, the entire family stayed in a villa. After that experience, I decided that families and groups traveling to Savannah should be able to experience my city that way too. In 2003, I ceased operating this home as a Bed and Breakfast and began offering this property as a vacation rental home exclusively. Savannah is such a great city...why not experience the history for yourself. Our home is conveniently located in the heart of Savannah’s landmark historic district on Broughton Street between Price and Houston Street. Guests can easily walk to our beautiful green squares & other historic sites. There are many shops and fine restaurants within a five minute walk. We have off-street parking for two vehicles as well as street parking. There is a an enclosed private courtyard between the main house and the carriage house. Kayaking tours are available near Tybee Island in multiple tidal creeks and salt marshes. There is an enclosed private courtyard between the main house and the carriage house. Multiple golf courses are located nearby and are a short drive away. We stayed here for my bachelorette party, and had the best time! The location was within walking distances of restaurants and shops, but quiet at night. The house had historic charm and was beautiful. Highly recommend! Great vacation home. Parking was difficult. We were pleased to have Jennifer and her family visit our home in Historic Savannah. They were excellent guests, and we hope they will return should their travel plans lead them back to Savannah. What a wonderful place to enjoy a stay in Savannah! We purposely chose the dates surrounding St Patricks Day, and what a surprise bonus to find it was right on the Parade route!! The house was immaculate and had plenty of room for all of our guests to relax. The grocery store was in a convenient location (driving distance) as was many delicious restaurant options. Ice cream (@ Leopolds) tempted us everyday on our returns home for the evening and we did indulge once- a must if you stay here! We found it easy to get to anywhere we were interested in going by foot. Thank you to Helen for reaching out during our stay to make sure we had everything we needed, and sharing your home with us and others to enjoy ! The house was immaculate and had plenty of room for all of our guests to relax. The grocery store was in a convenient location (driving distance) as was many delicious restaurant options. Ice cream (Leopolds) tempted us everyday on our returns home for the evening and we did indulge - a must if you stay here! We found it easy to get to anywhere we were interested in going by foot. Thank you to Helen for reaching out during our stay to make sure we had everything we needed, and sharing your home with us and others to enjoy ! Arrived late n thankful for all the basics toilet paper, tissues, coffee. Location great. Walked to river, restraunts, shops, parks, museums. Beds were comfy, water was hot, towels nice. WiFi great. Pack n play provided. Enjoyed our stay. I recommend n will rent again. Our group of 5 ladies stayed in this beautiful comfortable house for 4 nights. The owners were very helpful. The location is convenient to the trolley, historic homes, great restaurants, river street activities and of course Sabastian's icecream shop. I will definitely recommend the home to friends and family. It truly felt like a home. Staying there made out trip much more enjoyable. Pamela, it was our pleasure to have your ladies group visit and you were perfect guests. Hope you will return.